The language to Assembly Bill 293 was included in a budget motion that passed on May 25. However, that language was amended to change the dollar amount from $2.5 million annually to $500,000 because it was made clear by members of the Finance Committee and legislative leadership that $500,000 is the maximum we can receive during this budget cycle. While that was less than we originally requested, we also recognize it is a tough budget cycle and we are very fortunate to receive this funding as a starting point. Now that the budget has passed, we are working with partners to distribute the funding that was received to local health departments and local communities! What a great advocacy win! Please use this updated Communicable Disease Resolution Template for your board of health and/or county board. One of the highest priorities for public health in Wisconsin – and across the country – is efforts to prevent and control communicable disease, including familiar diseases like influenza, tuberculosis and common STDs, as well emerging threats such as the Zika Virus, Ebola and Middle East Respiratory Syndrome. Simply put, having a robust public health infrastructure in place is mandatory in a globalized world that provides new opportunities for the emergence and spread of infectious disease. Unfortunately, Wisconsin currently has no dedicated, stable funding source for communicable disease control and prevention. As a result, local health departments are challenged with a lack of sufficient staff and resources, which are necessary to support effective infectious disease prevention efforts. Even small delays in basic follow-up and contact tracing investigations allow for opportunistic diseases to spread and become a crisis. 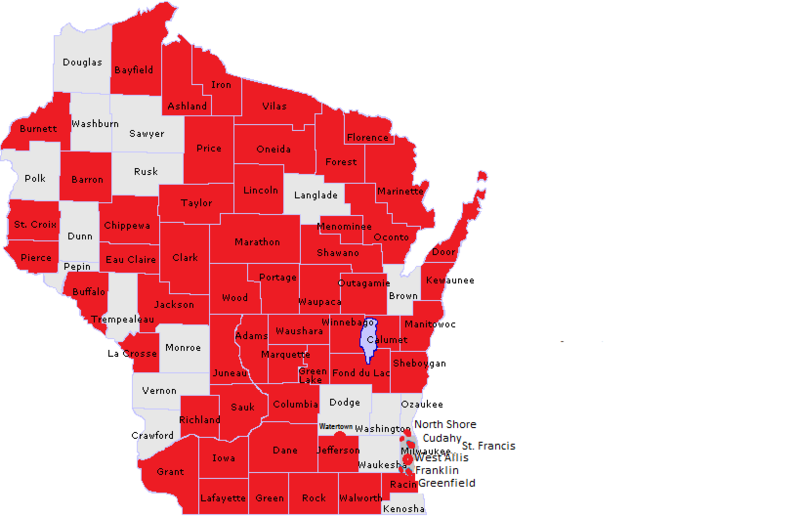 The counties and cities shaded in red to the right indicate those who have passed Communicable Disease Resolutions. (Reported-April 26, 2017) Click on the map to enlarge. 3/29/2019Legislative Action Alert – Attend the Joint Committee on Finance’s Public Hearings! Broken Links? Let us know!